A year before Kansas entered the Union as the 34th state, a Kansas political juggernaut was born in a log cabin, in what is now North Topeka, near the Kansas River. This professional politician went on to become a member of the House of Representatives, the Senate and hold the office of Vice-President of the United States of America. 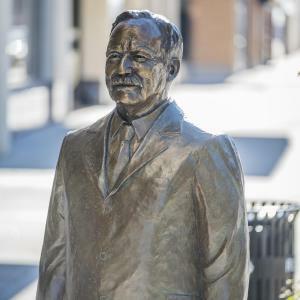 Charles Curtis was born on January 25, 1860 to Ellen Papin and Orren Curtis. Charles Curtis’ mother was of Kansa, Osage and Potawatomi descent while his father was European. This made him the first Vice President with significant Native-American ancestry. When Curtis was 3-years-old his mother died and shortly after, his father joined the Civil War and left Curtis and his sister on the reservation to be raised by their maternal grandparents. Curtis spent time growing up with both his maternal grandparents on the reservation and with his paternal grandparents in Topeka. In 1873, the Indian reservation was forced to relocate to Oklahoma. Curtis wished to travel with the tribe to Oklahoma but his grandmother convinced him to live in Topeka, with his paternal grandparents and get his education. During his time in Topeka, Curtis attended Topeka High School for several years. Although he didn’t graduate, he continued to study law while holding several different jobs. He became known as one of the best horse jockeys in the area and after winning several races he became well known as “the Indian Boy”. Curtis also worked as a clerk in the law office of A.H. Case and after passing the bar exam in 1881, he became a partner at the law firm. Three years later in 1884, Curtis married Anna Baird with whom he would have three children. Also in 1884, Curtis began his first campaign for public office and became Shawnee County attorney. In 1889, Curtis failed to win the nomination for a vacancy in the House of Representatives by one vote, but just three years later Curtis went on to win the election for a seat in the House of Representatives and was re-elected for the next six terms. This was where Curtis became truly knowledgeable in the way of politics and this knowledge would eventually help him make it to the Senate and Vice-Presidency. Curtis was elected Senator in 1907, a position he would hold unit 1929. During his time in the Senate he became even more influential. He eventually worked his way up to Senate majority leader in 1925 where he was known for his ability to accomplish results for both progressives and conservatives. Although Curtis had presidential aspirations, he was added to the election ballot as Vice President while Herbert Hoover got the nod for President. They went on to win the election and in 1929, he became the 31st Vice President of the United States.